Celine Tardy is a Graduate of Rutgers University, double major in psychology and communications. Currently is Web Content Editor for HSA. Farley and Betsy Jones, both early pioneers of the Unification Church, are one of many who are celebrating their 40 year anniversary this year of being matched and blessed by the Rev. Sun Myung Moon in the 777 couples worldwide Holy Marriage Blessing Ceremony held in 1970. They agreed to be interviewed in order to share their early experiences and witnessed developments in the movement, as well as memories of their relationship after the Blessing, with advice for other couples today. The Jones' couple has raised 5 children, and currently reside in Troy, New York. Please introduce yourself and explain how you joined the Unification Church. My name is Farley Jones. I joined the Unification Church in 1967, first in New York City and made a final commitment in Washington, D.C. I originally received a letter from a friend when I was on my way to NYC telling me about this new group. She said that if I ever came to NYC it was something I might be interested in, so when I got to NYC I looked it up. At the time there were only two young women in a single bedroom apartment on the West side of Manhattan, which is where I was introduced to the Divine Principle. I studied it for months, wrestled over some of the questions, and then went down to Washington, D.C. to look into it more deeply. I lived in the church center there with Ms. Young Oon Kim, the first missionary to be sent to the West by Reverend Moon, and other members, which is when I decided that this is the way I should go. By that time it was the summer of 1967. At that time a book had not been published yet, so how did you learn the Divine Principle? When I joined in 1967, we did not have the Divine Principle book that we have now. Instead, we had a half-inch thick book known as the "Blue Book," written and published by Ms. Young Oon Kim, which was a simplified version of the Divine Principle. One of the ways new members came to understand the Divine Principle more deeply was to read that book together in groups, page by page, raising questions, etc. It was a critical tool in the early days for coming to understand the Divine Principle. Tell us about Ms. Young Oon Kim recruiting you to be the President of the church. Six months after I had made a commitment in Washington, D.C., Ms. Kim made a tour of the centers in the United States. When she was in California, she wrote me a letter and asked if I would come out to Berkeley, California and work there with Mr. Edwin Ang to develop the Berkeley center. I drove out there in November, 1967, taking my blue Volkswagen bus across the country, met Mr. Edwin Ang, and started working in Berkley for roughly the next two years. While I was there, Ms. Kim made another visit, and the Berkeley center had prospered. It had done very well for various reasons; it was definitely a growing center. During her visit, she asked if I was interested in coming back to Washington to serve as the president (this was perhaps in the spring of 1969). I declined because I was very happy with what I was doing, and didn't feel the call at all. But then roughly six months later I received word that it was no longer a request or invitation for me to consider, instead it was an order: "Come to Washington, you're the president." So, I did. I came in December, 1969, and started serving as the president at that time. Shortly thereafter, to my great surprise, Young Oon Kim left for Korea, leaving me, a two-and-a-half year old member, around age 26, to be the leader of this new religious movement. I was completely unprepared, and unqualified. But, I stuck it out for the next three years. During that time, Father came to this country and began his work, so I had the blessed opportunity to encounter Father and to be with him in a very personal, first-hand way. That kind of redeemed my experience as the president; otherwise (laughter) there was a lot of difficulty to look back on in those years. I was the president until late (December) 1972. Can you tell us about what happened until 1972? My wife, Betsy, and I were married in 1970, in Seoul, Korea. And when we returned, we started our mission together 40 days after that in Washington, D.C.
On December 18, 1971, Father arrived in this country. That really is the date that he began his work here. What happened is that he inaugurated a whole new level of activity once he set his hand on the American movement. The first major thing he did was announce that he was going to do a 7 City Public speaking tour, in which we were going to rent halls in 7 cities, and he was going to speak to the general public. This was mind blowing for us, because we had never conceived of an outreach on that level. So Father brought this whole new level of energy, vision, inspiration, as well as demand on the membership. The movement was transformed from the time that he began his work here. I remember particularly the first city in which he spoke, New York City, at the Lincoln Center. About 40-50 members were all crammed together with him in a house in the Bronx. People would sleep until whenever they wanted to sleep to, get up and then sell tickets. One day, at 6 a.m. in the morning, Father stormed through the house, got everybody up, and in essence saying, "What are you doing, sleeping until whenever you want to sleep? This is a movement, we need discipline, we need to shape up here." So from then on, everyone got up at 6 a.m., and it became a much more disciplined, focused, organized movement under his leadership. It was completely new. What was the first year you started calling the group the Unification Church, and how did this happen? Up until Father's arrival in 1971, we were known as the "Unified Family." However, I think with Father's arrival we had the sense that we needed to give a more substantial image to the world, and there was this question about making a change. At that time I was the president, and I think I was the one who finally said, "OK, let's redefine ourselves and now be known as the Unification Church." I think that's the decision we made after Father had left in roughly March, of 1972. Father then came back in November of 1972. In the meantime he had been to Europe and Korea, but clearly his focus was on the United States. A whole other level of vision that he brought to the work being done in the United States was to bring people from other countries here. Again, nobody that I know of in the American movement ever had that idea. But Father was willing to mobilize worldwide resources here for this purpose. What was your personal experience with Rev. Sun Myung Moon? I had the great fortune, and it's still a great mystery to me now, to meet and work with Father firsthand as an American member. When he first came in December of 1971, I was a young president; I was immature, inexperienced, and not really ready for the job. Father was a wonderfully nurturing and caring Father for me. I think most members have encountered Father as this powerful leader standing up in front of hundreds, if not thousands, of people asserting his authority, and he certainly has that ability. But for this young, struggling president he was a very personally involved, nurturing presence. It was very strengthening and supportive for me, and again it was not only personal to me but was because I represented the American church and he wanted the American church to prosper and to be lead well. Therefore, he wanted to strengthen its president. There is that side of Father that I think many members may not know, but I had the precious experience of knowing this kind of very loving and present quality that Father also has. He is a man of great compassion that may not be perceived right away. One day, after making an appointment with Father in order to discuss my resignation (I thought I should resign from my position as president), Betsy and I went to True Parents' bedroom in Upshur house in Washington, D.C. As we walked in, Father and Mother were sitting on the bed, and Mrs. Choi, Father's secretary, indicated we should sit on the floor. This seemed entirely appropriate to me, that we would sit on the floor, below, and True Parents would sit up on the bed, above. Suddenly, Father got up off the bed and walked over and sat down on the floor with me. And it touched me deeply. He was very encouraging, very supportive, which lifted me up. I felt so empowered, encouraged, and healed by that personal encounter I had with him. Even so, many times thereafter I struggled, but I often would think, "Because you sat on the floor with me... I'm going to stick by this." What kept your faith in the Unificationist movement, and its teachings? When I first heard the teachings of the Divine Principle, what struck me was the teaching of the relationship between man and woman. My own parents had been divorced; my father left our home when I was around 10 years old -- it was a very painful loss for me. I'd had some girlfriends; nothing seemed to be sustainable for me. I did not want to repeat for my children what I had gone through; I was looking for a way, perhaps unconsciously, to be successful in the realm of marriage. So when I heard the Divine Principle teachings, it clicked. It was the answer to an unspoken prayer. What was your relationship like when you were first blessed in marriage and how do you feel it has developed? 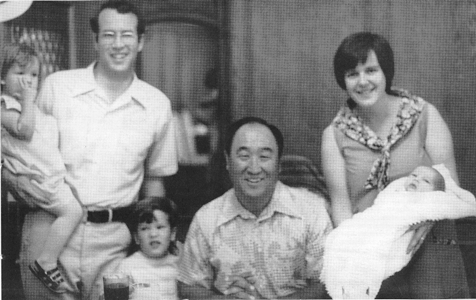 Betsy and I were blessed in 1970, in Seoul, Korea, and as it turned out I was her spiritual father, in that I had previously introduced Betsy to our movement. After our actual wedding, and we started living together, I thought I knew my wife because I was her spiritual father, and we had worked together for a few months before our blessing. Little did I know, and little did Betsy know, the first months and years of marriage would be a dramatic learning experience. Speaking frankly, these were tumultuous months as we tried to figure each other out. Betsy is very sensitive to her emotions, and aware of what is going on within herself. However, I had none of those skills. I was very mission-oriented, very focused, and she was very interpersonally oriented in terms of our relationship. So we had a lot of learning to do in order to live with each other in a harmonious way. When Father started his work in the United States in 1972, which is roughly a year and a half after we had been married, Father sent Betsy out as one of the first itinerary workers. So we had a type of forced separation. This turned out to be a hidden blessing, because it gave us both a chance to mature more individually, and when her work came to a close, we were both in a very different place. From then on, our marriage became much more sustainable. We have been married for 40 years, as of this year. I will say it has been an absolutely wonderful experience to mature in love with a spouse over time. It takes time, it's a long course, and it has not been a smooth course at all; no marriage is. But at this point we are in a very wonderful state in our marriage, in our relationship, and I'm very grateful for that. My name is Betsy Jones, and I come from a typical Irish-Catholic family in Boston. My older sister was a Catholic nun. I had also seriously thought of becoming a nun myself, but instead decided to become a missionary for the Catholic Church when I graduated from the Boston College School of Nursing. I spent a whole year in the West Indies. However when I came back, I was still feeling like I was supposed to do something for God. I had signed up for a Master's program in New York City, but before I left, I remember saying to my Mother: "There is something I'm supposed to do for God, and I don't know where it is." She responded, "Just go to New York, and at some point it will get clearer." Around March, I happened to meet Farley Jones at the Columbia bookstore. He told me he was studying with a man named Mr. Moon in Korea, and he wanted to ask me, as a good Catholic, what I thought of the Principle of Creation, and the Fall of Man (core theories of the first two chapters of the Divine Principle text). So I told him I liked these ideas, especially about the Fall of Man. I felt it was refreshing to meet a young man in New York City who believed in morals and values, and I was looking for something like that. He told me he was about to buy a sleeping back and go to Washington D.C. So I wished him well on his journey. Later, a letter came from Farley Jones just asking me to study these ideas, and to try not to judge the people. So over the next few weeks I studied the entire Divine Principle, and I could really relate with it, except when it came to the conclusion about the second advent. I felt a lot of conflict because I had a strong relationship with Jesus, yet I really wanted to understand and not deny the fact that maybe God was teaching me something and leading me somewhere. I then went with the members to Washington D.C. and I met early members such as Nora Spurgin, Farley Jones, and many others including Ms. Young Oon Kim. I was trying to act like I wasn't that interested in what they were doing there, but when I went to say goodbye a flood of tears came out of my eyes; I had never felt that before. I felt that if I admitted it to myself, I had found my spiritual home. Later, I was still in conflict about whether what I was learning was true, and I heard a voice say, "Betsy it's true, it's true." So I signed the membership that night. What was your relationship like when you were first blessed, and how, do you feel it has developed? Before we left Korea, Father spoke a lot to our couples for the 777 couple Blessing. In fact, he paced up and down many times and said "love your enemy." Then he said, "Your enemy will be your mate." At that time we were all looking around and thinking, "Well, how does this relate to us?" Farley and I didn't feel that. But I think as soon as we came back to America, we were facing a lot. With Farley being the president of the church, he had a huge sense of mission, a very vertical focus. However, when I became a new wife, I remember thinking: "Well what about me?" A few times I read his diary and it always said something about the church, and his relationships with this person and that person, and I couldn't find anything about me. So I realized at that point, we had a lot of differences as well as a lot of pressure on our couple because of Farley's position. We were supposed to be the ideal model for other couples. So, this combination felt like a pressure cooker. But after our disagreements I remember that Farley was always the first one to say, "I'm sorry for my part." And then I would easily be able to say, "And I'm sorry for mine." However, over time some of the members had heard fighting when they passed our room and maybe reported this to Father, so one morning at 5 a.m. Father invited me to sit down when I was serving tea in their room. He asked me to tell him about the fighting going on with my husband. I was hesitant to admit the truth to him, because I was thinking, "Well I'm fighting because he's like this and that," but then in front of Father the truth came out. I said, "Well, I guess I want him to be like me." Father laughed and said, "Yes, this is the problem. Farley's personality is actually 50 percent, and your personality is 50 percent. You have to make space for both." Then he went on to say, "Do you want a beautiful house in the spirit world, where there are mountains and sunsets?" I said, "Yes," and he said, "You have to sacrifice something now, meaning give up that time together that you might have as a couple and offer it for the sake of God and this mission." Somehow I understood when Father talked to me like that, and realized I had been thinking too much along the lines of a stereotype of what a young couple should be. I remember going upstairs when Farley was still sleeping, and I stood over him and in tears said, "I'm sorry. I'm sorry for being angry, and not appreciating what you are trying to do." I felt like I changed because of Father's guidance. What differences are seen today in our movement after 40 years? What is beautiful to see today is that our movement, and especially our community, is much more family oriented. I am very happy about the amount of emphasis and change of policies that have come through about the matching and blessing, because I feel it puts much more responsibility on individuals for the outcomes they will get. I also really value the development of training that's available through programs to help couples, so it's not just "Keep your blessing, keep your blessing (marriage)," but instead: "This is how to do it." I hope in the future we can become known as the church that gives the most wonderful education to people before, during, and after they are married, together with education on parenting. And I think we are moving in that direction now. When going to the Lovin' Life service these days in New York City, I remember it being only two members before in this little apartment in Times Square. Sometimes today I just shut my eyes and feel so moved when I see what is happening in Manhattan through the Lovin' Life Ministry. I feel very grateful to Rev. In Jin Moon for bringing all her love for True Parents to us. I think she is helping all the children, including my own children, with her testimonies of her own parents and her overcoming her own pain. Doing this gives a great model for all second generation who all have been through so much. What are you and your husband currently doing in the year 2010? In 2010, Farley continues to serve on the board of Holy Spirit Association (HSA) and the Unification Theological Seminary (UTS). Both of us are also on the board of the Bridgeport International Academy (BIA). Together we run the Peaceful Center in Farley's hometown, Troy, New York. It is located on the first floor of our home, in downtown Troy, where classes in yoga, meditation, and relationship enhancement (couple's seminars etc.) are held. Please check www.peacefulcenter.net for more information. Together we gave a couple's seminar in Montreal, Canada this past year, and I also helped with the WFWP project in Haiti and will be helping with a women's seminar on personal development in Alabama at the end of October. Besides teaching nursing part time, I also do counseling through church referrals from organizations such as the Blessed Family Department, and privately in our community. Farley continues to practice law on a part time basis and also takes primary responsibility to administer the Peaceful Center. We both support our local church, as well Lovin' Life Ministries with Rev. In Jin Moon. We also hope to help with the development of projects related to this. We have been distributing Father's autobiography to family and friends, and plan to do a larger mailing of signed books with our Christmas cards this year. Finally, we are blessed with 5 children and 6 grandchildren. We enjoy seeing them as much as possible.